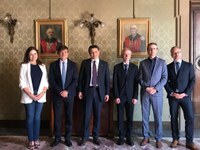 Six leading European universities have signed an agreement in Bologna which opens up a shared, multilingual and multidisciplinary academic space. The future of European universities starts from Bologna. The European University Alliance is born: six prestigious European universities - Freie Universität Berlin (Germany), University of Bologna (Italy), Uniwersytet Jagielloński w Krakowie (Poland), KU Leuven (Belgium), Universidad Complutense de Madrid (Spain), and Université Paris 1 Panthéon-Sorbonne (France) – can finally speak with one voice at an international level. This agreement marks a close alliance that opens up new horizons for higher education and scientific research, and may lead to a truly European University. Thirty years since the Magna Charta Universitatum and two decades after the Bologna Declaration, a renewed "European ambition" begins once again from universities, the guardians of European values and the nurturers of tomorrow's talents. The European University Alliance aims to encourage a structural development of the European Higher Education Area and the European Research Area, establishing long-term, sustainable, solid and dynamic relationships. The six universities involved in this agreement are brought together by longstanding collaborations through student exchanges, the creation of double degrees, joint theses and participation in projects and networks funded by the European Union. The creation of the European University Alliance marks a further step towards the achievement of a shared European, multilingual and multidisciplinary academic space. It is a pilot project towards the European University of the future, where students will be able to attend integrated courses across various countries and in different languages, and researchers will be able to move freely among multiple locations, following the needs of their research projects. Today’s agreement, signed in Bologna by the representatives of the six universities involved, follows a first meeting held on February 13th 2018 in Paris and officially initiates a synergetic dialogue that will continue in the years to come. The “EHEA 2018” label has been granted to today’s event by the French Ministry of Higher Education, Research and Innovation, in the framework of the upcoming Ministerial Conference that will be held in Paris on 24th and 25th May 2018, where the future of the Bologna Process will be discussed. Without prejudice to their existing engagements, the partner institutions of the European University Alliance are committed to developing coordinated and joint actions at an international level, based on common interests, objectives and values, addressing challenges of the European society. The partner institutions of the European University Alliance are also united by a deep-rooted European heritage , which they intend to build on in order to cultivate a stronger European identity, while remaining fully open to the world. Together, they constitute a single point of reference for students, researchers and teachers all over the world, and they are ready to collaborate with national, European and international institutions on the ideas, policies and choices that will shape the future of education and research.